An exhibition “Following the Associations” will open on August 1, in the basement of the Cameron Gallery. It will demonstrate the works of the fashion designers, created for the theatrical defile “Gothic: new meanings”. Gothic was the main theme of the fashion event “Associations-2017”, which took place on June 24 in Catherines park. The members of the current “Associations” project are the well-known Saint-Petersburg designers Tatiana Parfenova, Leonid Alekseev, Lilia Kiselenko, Stas Lopatkin, Janis Chamalidi. 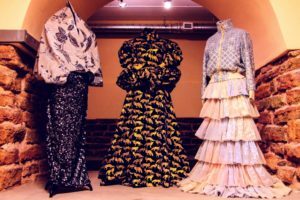 For the ninth time, the Tsarskoe Selo museum invited leading St. Petersburg designers to create collections dedicated to the summer residence of Russian emperors. The theme of Gothic style set designers a bold task to convey mysticism, romanticism and expressiveness of the Gothic style. In 2017, the designers showed their collections at the following sites of the Catherine Park: Tatiana Parfenova – the Freilinsky garden; Leonid Alekseev – the Mirror pond; Lilia Kiselenko – Admiralty; Stas Lopatkin, Janis Chamalidi – ruins of the tower. Each of the five designers will present three suits at the exhibition in the Cameron Gallery. Days-off – Wednesday and Thursday. Entrance is opened from the side of the Freilinsky garden. The exhibition is open until August 31, 2017.